On Patriot’s Day, May 15, 2013, at 4:09 pm during the Boston Marathon, two bombs that brothers Tamerlan and Dzhokhar Tsarnaev placed near the finish line exploded sending shrapnel, BBs and nails everywhere, killing three and injuring more than 200 innocent adults and children. Sports Technology was a major story behind the Boston terrorist bombings. On Patriot’s Day, May 15, 2013, at 4:09 pm during the Boston Marathon, two bombs that brothers Tamerlan and Dzhokhar Tsarnaev placed near the finish line exploded sending shrapnel, BBs and nails everywhere, killing three and injuring more than 200 innocent adults and children. Even before the suicidal brothers arrived to place their backpacks on the ground containing the pressure cooker bombs behind spectators, sports technology checks and balances were already in place that would eventually led to their capture. Tech also helped show world revolutionists that stopping terrorism takes a community effort and we are in it to win it. The FBI’s mission is clear—to bring to justice those responsible for the marathon bombing, and after today, this goal is closer to being achieved. Boston officials planned a moment of silence for 2:50 p.m. on Monday to mark the passing of one week since the bombings. A minute later, bells will toll to honor the victims. Krystle Campbell, eight-year-old Martin Richard of Boston’s Dorchester neighborhood, and 23-year-old Lu Lingzi, a Boston University graduate student from China, died in the attacks. On Sunday, thousands of runners at the London Marathon honored the victims of the Boston Marathon bombings with a 30-second moment of silence. After the moment of silence, our country will then put its efforts to seek answers and justice, and there will be no pause in that for public safety by law enforcement, intelligence, and public safety agencies. These charges stem from the use of an improvised explosive device, or IED, and can result in a possible death sentence or imprisonment for life for any term of years. The state of Massachusetts does offer the death penalty so these official charges are a significant legal step by FBI Director Mueller and the United States. Massachusetts Gov. Deval Patrick said Sunday that surveillance video from Monday’s Boston Marathon attack shows Dzhokhar, also known as Jahar, dropping his backpack and calmly walking away from it before the bomb inside it exploded. An investigator who studied their video images after the bombings said the two brothers “acted differently than everyone else” — they stuck around and watched the carnage unfold, and walked away “pretty casually.” Dzhokhar is currently at the Deaconess Medical Center and remains in serious condition. Reports from today say he has an injury to the throat and may have tried to commit suicide. Jahar was inside TD Bank Garden arena last year when he became an official American citizen. The ceremony was held on September 11, 2012, the anniversary day of 911, a fact that makes this story even more bizarre. The neighborhood in Cambridge where the brother’s family lived at 410 Norfolk is a melting pot of the U.S. — a blend of blue-collar immigrant families and university intellects who attend Harvard and MIT. Dzhokhar was a student at the University of Massachusetts-Dartmouth. 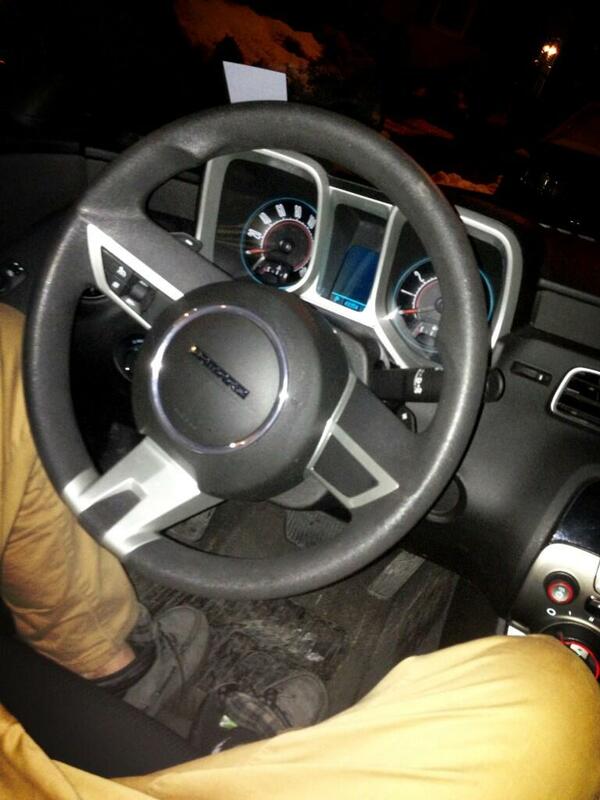 The picture and videos Jahar posted on Twitter show him to have several Sports Techie qualities. He posted pictures touching on the movie Men in Black, Peps the family cat, and ironically, a car steering wheel that is now an omen because he ran his brother over with a similar looking one. The following tweet by Jaher posted on January 16th may be an indicator of what was really going on inside of him unbeknownst to his family, peers and social network. In West New York, N.J., the FBI seized a computer, cell phones and other electronic devices from the home of sister Alina Tsarnaev. The social media phenomenon of live tweeting from an event is exploding in popularity. Jahar himself was part of this after the Boston Marathon when he tweeted while on the run after the bombs had gone off, which is sickening and bewildering at the same time. More people than ever before have mobile device that give them immediate access to the Internet. Most users have learned how easy it is to share these experiences by forming tweets that describe what is happening to you in real-time to your Twitter friends. Adding pictures and video can also be included into live tweets as was the case at the Boston Marathon by many who witnessed firsthand the initial carnage and the resulting aftermath. Live tweeting is not a new phenomenon but when the bombs are the first domestic terrorist explosions in America since 911; you better believe our nation came alive with real-time social media posts and tweets directly from the devastation. Letting loved one’s know by social media means that you are ok during a live event emergency is a powerful communication tool that can ease the minds of family and friends. Do a Google or Bing search and look for eye witness accounts of the Boston Marathon terrorism. Here is a YouTube video I found when I did an Internet search. Michael Holland, chairman & founder at Holland & Co. recounts his experience Bloomberg as a participant in the Boston Marathon as the event was rocked by bomb blasts. Perhaps the best live tweet ever happened when the Boston Police Department let everyone know via twitter that the suspects were in custody. The hunt for the brothers took a turn when it went viral because of crowdsourcing activities. Reddit, 4Chan and other technologies were used to help capture the suspects by providing a platform that enabled viewers to point out suspicious content in pictures that were posted. At 1:45 pm the day of the bombing, the Sports Techie was in the moment, similar to when Hurricane Sandy occurred. I had a random thought about all the Sports Techies at the marathon that had their smartphones and tablets filming away, in addition to the runners themselves who had a GoPro or Contour cam recording as they ran the challenging 26.2 mile course. I tweeted this thought for the good our community and to lend any Sports Techie assistance possible with apprehending the amateur but determined, armed suspects. Will authorities ask for Boston Marathon fans to submit smartphone and tablet video to help find incriminating evidence? Asking the public to contribute any evidence on a smartphone or tablet from the bombings event was a stroke of genius by the FBI. Having your own army of digital detectives turning in any incriminating evidence in video, picture or social media format, turned the tides of this manhunt. The brothers led the world on an unprecedented four day wild goose chase that ended in capture or death. This ended feels like a short term success though against our life long fight against foreign and domestic terror. Let’s hope interstellar terror is not part of this any time too soon while we figure out how to handle this increasing problem on planet Earth. For best and for the worst, social media and hashtags are now used to help. In this case, the help goes directly the bombing victims and the bombardier. #BostonHelp, The Journal.ie shared how – Twitter users offered support to runners and others who might be in need in the city of Boston after the devastating explosions there, under the hashtag #BostonHelp. The tag began trending late this evening as social media users tried to find a constructive way to help those caught up in the day’s horror. Some offered accommodation, advice on how to track loved ones – and even pointed out that Massachusetts General Hospital is appealing on Facebook to locals to go there in the morning and donate blood for the injured. #FreeJahar. Yes, as is the case in a democracy, Jahar is indeed innocent until proven guilty if he did it at all, or so say his supports on Instagram, Twitter and via other social networks on this fresh hashtag. Suspect #2 did not receive his Miranda rights as all citizens of the U.S. have a right to because this is a terror related case. This hashtag has fueled his popularity as a cult hero. 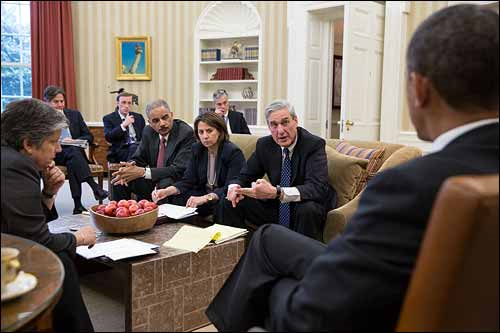 FBI Director Mueller updates President Obama on the explosions that occurred in Boston. The FBI Boston’s Joint Terrorism Task Force, composed of more than 30 federal, state, and local law enforcement agencies, including Boston Police, Massachusetts State Police, and ATF, HSI, United States Secret Service, and others responded to the scene. Many of them were already there as part of the general security for the marathon already in place. First responders focused on establishing a criminal investigation. The JTTF enlisted the public’s help to identify the two suspects. 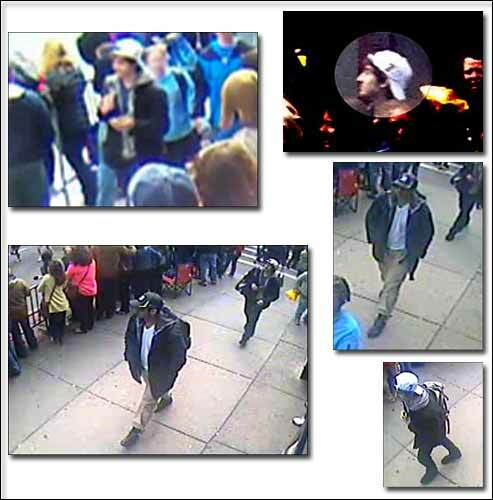 After a very detailed analysis of photo, video, and other evidence, the FBI releasing photos of the two suspects. They were identified as Suspect 1 and Suspect 2. They appear to be associated, forewarned the FBI. As soon as President Obama and the Joint Terrorism Task Force (JFFT) felt the time was right, they enlisted the public’s help by releasing video evidence from cameras that were mounted on the streets that showed both men walking down the sidewalk looking like any other U.S. citizen. Investigators released the clip directly to the media who distributed it to the public. The pace at which the two suspects walked indicated to me initially that perhaps they had someone to watch crossing the finish line and wanted to make sure they made it on time. In hindsight, the video looks like it’s really showing us two cool and calculated killers on a death march. While studying at Whittier College in 1994, I took a January interim Political Science course taught by Professor Fred Bergeson. Our small class interviewed local, state and federal employees about how they might work together as a task force. Because nuclear weapons from Russia may have been unaccounted for, it was our task to interview police, sheriff and FBI agents as to how they planned to work together should it be required on the future. I learned that since there are so many moving pieces to a task force, massive amounts of communication and data was not shared in an optimized way in 1994. The JTTF proved to me that this was no longer the case with our government in 2013 by their cohesive and timely handling of the Boston bombing investigation. 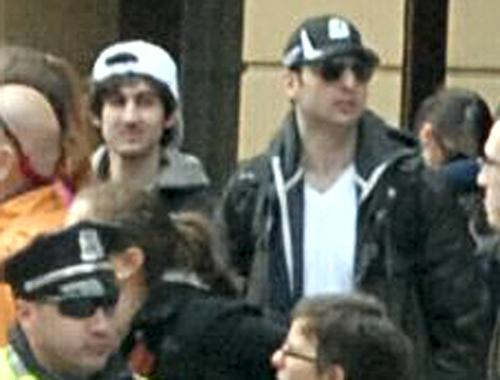 Tamerlan (Right) and Dzhokhar (Left) Tsarnaev were suspect #1 and #2 in the Boston Marathon bombings. Tamerlan Tsarnaev studied accounting as a part-time student at Bunker Hill Community College in Boston for three semesters from 2006 to 2008, the school said. He was married with a young daughter. The neighborhood in Cambridge where the Tsarnaev family lived at 410 Norfolk is a melting pot of America — a mix of working-class immigrant families and college students who go to Harvard and MIT. In early 2011, a foreign government asked the FBI for information about Tamerlan. The request stated that it was based on information that he was a follower of radical Islam and a strong believer, and that he had changed drastically since 2010 as he prepared to leave the United States for travel to the country’s region to join unspecified underground groups. In response to this 2011 request, the FBI checked U.S. government databases and other information to look for such things as derogatory telephone communications, possible use of online sites associated with the promotion of radical activity, associations with other persons of interest, travel history and plans, and education history. The FBI also interviewed Tamerlan and family members. The FBI did not find any terrorism activity, domestic or foreign, and those results were provided to the foreign government in the summer of 2011. The FBI requested but did not receive more specific or additional information from the foreign government. Could it be that the older brother who was a gold gloves caliber boxer for a time, suffered concussive blows to the head that may have caused damage that went untreated for long enough to change his personality to be more accepting of radical ideology. An autopsy on suspect #1 will help clear that up. http://www.cbsnews.com/video/watch/?id=50145239n. Surveillance video at the convenience store where they shoplifted was the first clear cut picture of the suspects and what they wore that night. They then high jacked a Mercedes Benz SUV and its driver. As police closed in on the bombing suspects Thursday night, law enforcement officials say two officers were shot. One, transit police officer Richard Donohue, is in critical condition at Mount Auburn Hospital. The other, Sean Collier, a Massachusetts Institute of Technology campus police officer, was pronounced dead. The death of the MIT led to an ensuing car case that including pipe bomb explosive devices being thrown out the window at the pursuing officers cars. A Watertown officer spotted the vehicle and followed it. The brothers stopped the car and attempted to get the officer. Suspect #1 had a bomb attached to his chest and charged at police when he was shot dead and then run over by his brother as he fled the scene in the high jacked SUV. Police initially tracked the escaped suspect by a blood trail he left behind a house after he abandoned the Mercedes. David Henneberry was on a walk and saw that a neighbor’s boat cover was ripped. He grabbed a ladder to look inside the boat and saw a body that moved, he quickly left and called 911. Three officers initially surrounded the boat and more officers came to assist. A helicopter used infrared technology to confirm that a living person was inside the boat. A robot was used to pull the tarp down in order to get a better look at the suspect and whether he too had explosives strapped to his body like his brother did when he was finally subdued. The FBI rescue team arrived. The HRT or Hostage Rescue Team was in charge and extracted him from the boat he had been hiding in all day. 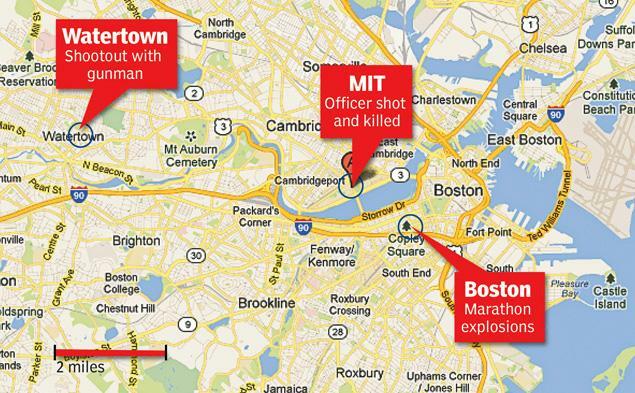 A map highlighting the Boston Marathon, MIT and Watertown locations. First responders included the brave police officers who as soon as the bomb went off ran to protect and aid the injured and dying with little regard to their own safety. Boston EMS and Boston Fire Department were there in force and heroically rushed into the detonation zone to save lives and perform triage where it was most needed. All the volunteer physicians, nurses, and medical staff from the community made a lifesaving difference for many of the 200 wounded souls. Providing services and ambulance rides while in the face of danger and the unknown is the ultimate sacrifice for a fellow human being. The United States is the nation full of first responders. Unexploded bombs are a danger to officers and the public alike. No additional bombs were found along the marathon route. No comment is being made as this time on what was found in one of the suspect’s apartment. Dozens of packages dropped by fans fleeing the scene had to be painstakingly investigated as another operational bomb. Bombers often target first responders so utmost care was needed by these experts to ensure public and personal safety. Their goal was to recover physical items and data related to the blast. Those items were recovered and sent to the FBI’s Laboratory in Quantico, Virginia. There, specialized examiners reconstructed the device and determine its makeup and components. Among items partially recovered were pieces of black nylon—which could be from a backpack—and what appear to be fragments of BBs and nails possibly contained in a pressure cooker device. They expedited this blast evidence to their lab for a complete and thorough analysis. The Boston blasts produced similar trauma and the kind of wounds caused by terrorist bombs in the Middle East, Africa and elsewhere. Many of those bombs had more explosive power which is often seen in video by windows exploding in nearby buildings, something that fortunately did not occur in Boston. At least a dozen survivors have undergone amputations and several remain in critical condition. It is hard to see the light for these victims; however, we now live in a time when prosthetics and bionics are beginning to give wearers seamless activity experiences much like they experienced before the loss of a limb. Wounded Warrior Project is a good resource for counseling for this type of grief; you can ask questions and get support. The boys have roots from the Dagestan region of Russia and the former Soviet republic of Kyrgyzstan. Chechnya has undergone two wars between Russian forces and separatists since 1994. That morphed into an Islamic insurgency that has carried out deadly bombings in Russia and around the Eastern hemisphere. The Russian FSB intelligence service told the FBI in 2011 about information that Tamerlan was a follower of radical Islam, according to two law enforcement officials. According to an FBI news release, a foreign government said that Tamerlan appeared to be a strong believer and that he had changed drastically since 2010 as he prepared to leave the U.S. for travel to a region in Russia to join unspecified underground groups. The FBI did not name the foreign government, but the two officials said it was Russia. The officials spoke on condition of anonymity because they were not authorized to talk about the matter publicly. The FBI said that in response, its agents interviewed Tamerlan and his relatives, and did not find any domestic or foreign terrorism activity. The bureau said it looked into such things as his telephone and online activity, his travels and his associations with others as the deciding factors. President Barack Obama said there are many unanswered questions about the bombing. If you have visual images, video, and/or details regarding the explosions along the Boston Marathon route and elsewhere, submit them on https://bostonmarathontips.fbi.gov. No piece of information or detail is too small. You can also call 1-800-CALL-FBI (1-800-225-5324), prompt #3, with information. All media inquiries should be directed to the FBI’s National Press Office at (202) 324-3691. The FBI is encouraging individuals and families that were directly impacted by the bombings to contact the FBI Victim Assistance Call Center at 1-800-331-0075 to provide their information. Victims will be put in contact with the FBI Office for Victim Assistance. Sports Techie, The entire week long Boston Marathon bombing incident and resulting investigation, manhunt, and shootouts, felt like a full season of the HBO Homeland series. The Commonwealth of Massachusetts, the city of Boston, the city of Cambridge, and the city of Watertown all get our highest regards for handling this adversity with resound, resilience and the same kind of determination as our countries founding forefather’s centuries ago. The collaborative efforts by the JTTF were focused on saving lives and treating the injured. At the same time, resources were directed to ensure the safety of our community. How much exactly was spent to apprehended the suspects is anyone’s guess by it must be in the millions of dollars. This is considered a federal case involving terrorism and because of this, no Miranda Rights were to be given to suspect #2. Officers where told about these rules of engagement and followed orders. By officially charging Jahar, a strong message has also been sent to all terrorist organization, cells or individuals, that the U.S. is letting it be known that no matter what your evil purpose is, both foreign and domestic, if you attack American citizens at a sports or tech event, you will fail in meeting your goals. At the same time, tragedies like this polarize our nation and the globe together in this all important game of terror. The obvious question to continue to ask is whether the brothers indeed acted alone. If the JFFT and President Obama had any game changing information as to the answer they would most likely not release it to the public and continue working the leads, or distribute data in a strategic manner as was done in Boston. Patience is needed because time will tell whether or not the two really did this all by themselves. I will update this blog with any breaking news. There are so many things I would like to cover in regards to this event. The gripping singing of the national anthem by fans at the Bruins NHL hockey game is the stuff the gipper was made of. Neil Diamond sang, “Sweet Caroline,” at the next Red Sox game. And the social media and event teams at the Boston Marathon did yeomen work throughout the week. As a blogger, I was taken back by the need for CNN to get information out as fast as possible to the point of false reporting and possibly endangering the operation. Sure CNN ratings where spiking like it was an election night but journalism integrity is an absolute must for a democracy to function properly. On the other hand, I personally and professionally applaud CNN for their continued efforts to inform the free world in a non-partial manner about acts of terrorism because without these types of tireless media allies, terrorism gains ground, recruits and funding. The fact that most of the marathon runners who were still racing three hours after the leaders had already finished were either first time runners or were doing it for charity, is confusing. Why was the finish line not targeted when the winners crossed the line because more fans and media would have been around? Was escaping ever a real possibility for the brothers? I also hope this was not a test to measure how our nation responds to terror in the year 2013 when compared to 2001. Two lone amateurs apparently planned and executed the Boston Marathon bombings. Sports events are the kind of high profile opportunities that terrorists have had a history of attacking. What happens if a team of trained terrorists target the next Super Bowl 48 or the 2014 World Cup in Brazil? Chechnya is at odds with Russia who are hosting the winter Olympic Games in Sochi next year. How safe will all the venues, athletes and fans be is a worldwide concern. The acts of terror during the Munich Olympics in 1972 happened when I was six years old. Another generation of young America’s was just taught their lesson by these cowardly Boston bombings about the price American pays for having freedom when others live under tyranny, sexism and slavery. The other thing I wanted to note was the lack of facial recognition technology success when the first video of the suspects were released. I understand that the right perspective is needed to use facial recognition tech and even if it is used, the suspects may not have been in the databases being queried. Having said that, perhaps the video was also released to help quell our nation’s fears and to turn us into a proactive nation full of terrorist fighting Sports Techie. If so, it worked. Finally, the celebration after the second suspect was apprehended caught me as almost un-American and let me explain why. I get that the sense of relief was overwhelmingly for most but cheering every rescue or police vehicle that drove by while all the media cameras rolled by was for sure genuine but at the same time may have sent out the wrong message to the rest of the world. I did not understand why we publically cheered, partied and somewhat gloated as a nation when Bin Laden was killed. After the two brothers were put down, people on TV looked like the Red Sox had won their first World Series. Doing this would send a stern message to every terrorist out there that we are not happy when revengeful or justified death occurs, rather, as a nation we are somber, humble and accept the grave responsibilities that are upon us in this tooth and nail fight against terrorism. Free people are in this battle all the way until we are the clear winners against terrorists, and only then can we have a real celebration full of high fives, cheers and relief. Keep those smartphones and tablets recording at your sports and tech events, share the content and keep the faith. Remember, we are a Sports Techie nation full of first responders and resistant is futile when it comes to freedom.